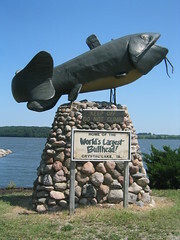 The World’s Largest Bullhead Fish was a “buzz-by” attraction. We buzzed-by this attraction on our way from a factory tour to museum. We stopped, hopped out of the car, took plenty of photos and left. The fish is a real beauty and I’m sure plenty of fisherman wish they had caught a bullhead fish this large. There wasn’t any extra information near the fish to give us any idea why the town went to all of the trouble and expense. In fact, there wasn’t even any information on exactly what a bull head fish is, but maybe everybody around there knows and consequently figures everyone else should know too. I did find that the fish was built in 1958, measures 17 feet, 8 inches long and is well-maintained. Definitely worth a stop for a few photos.